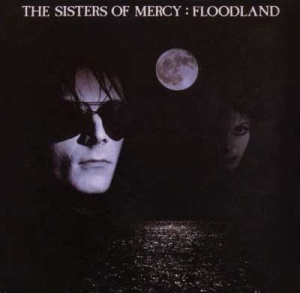 The The Sisters Of Mercy's second album was titled Floodland. from Merciful Release, which can be found under A Short History. these vids. They are also included in the revised video collection Shot Rev 2.0 . Note: The album was originally launched on 13 November 1987. There are differences in track times between the various formats. These are most noticeable on Driven Like The Snow and This Corrosion. The 2006 reissue had, for the first time, the full demo version of Never Land. In the past, a full length demo had surfaced, but that was an instrumental. This new version comes complete with vocals. Emma was taken from the Dominion 12". 2. Sandstorm / Untitled had already been featured on a charity compilation CD in the early 90's. For plenty further pictures of all releases, please see The Ultimate Sisters Guide / Floodland. 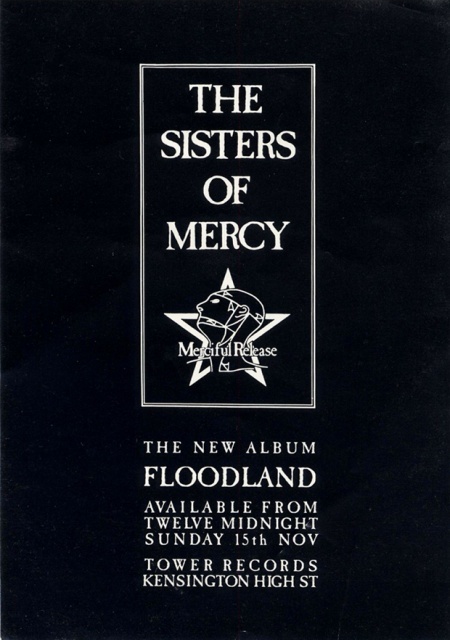 You worked on Sisters Of Mercy's Floodland. That's one of their most famous records. Did you work on her song "Total Eclipse of the Heart"? No. It was after that. 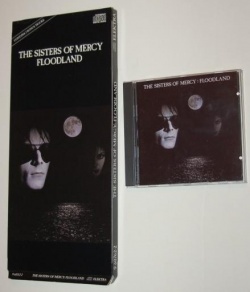 Andrew Eldritch, from Sisters Of Mercy, was a big fan of Jim Steinman. He hired Jim to produce two songs, and I was working with Jim at the time, so I ended up engineering. 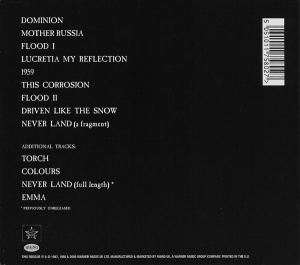 So, Jim produced those two songs: "Dominion/Mother Russia" and "This Corrosion." Andrew had been producing himself over in Manchester, and he wasn't getting anything done - he basically had a mountain of tapes. They didn't even know what was on the tapes at that point. So, his management asked me if I would go over there, and help sort things out. They'd go, "Oh, Clearmountain is unavailable? Give me Larry." They didn't care! We were all good. There wasn't such a big thing about freelance engineers back then. People would come to The Power Station because they thought The Power Station gets really good sounds. How many reels was this? At least a hundred reels. I went over to Manchester. They had safeties, but they didn't know which were the originals and which were copies. They didn't have the track sheets... it was just a big mess. So, we spent a lot of time going through the tapes and trying to sort them out. The first thing I did is I'd lined up all the tapes and numbered them. So, then every tape was unique. Then we continued, and eventually did the album. Were you building the album out of that stuff you were finding on these tapes? I don't think we used all that much of what was already there. I think we pretty much started over. Was it good to go through and find the ideas? Yeah. Yeah, we might just use one loop from a song and build everything on top of that. Andrew was really creative. I guess the deal was that there had been a band, Sisters Of Mercy, and they broke up. Andrew said, "I'm gonna keep the name." And the rest of them said, "No, we're keeping it." The guys that became The Mission? Yeah. They said, "We're keeping the name. 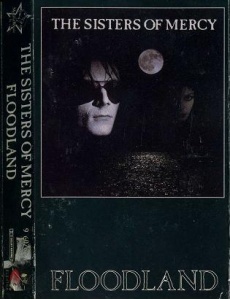 We're Sisters Of Mercy." 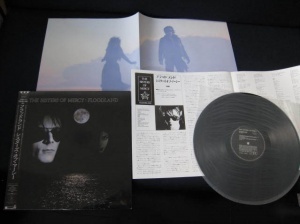 Andrew rushed into the studio, and recorded an album and put it out as Sisters Of Mercy. He's like, "I'm Sisters Of Mercy!" Basically, he did everything. There was a bass player, Patricia Morrison, but he wouldn't let her do anything. 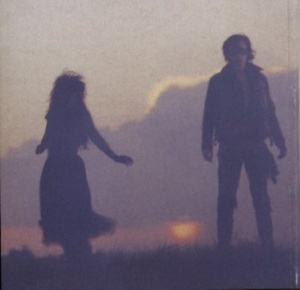 Even on the album you see his face and Patricia's face is off in the clouds kind of fading away. How long did that album take? It took a while. Manchester is kind of an industrial place, and we were in a studio [Strawberry Studios] that had actually closed. So we got a really good deal. They said, "If you wanna work in here, you can, but we have nothing to do with it." We recorded in Manchester, and then we were supposed to mix in Bath but we weren't done recording. Bath is the opposite of Manchester. Bath is like sunlight, really bright, beautiful, and we worked in this place called The Wool Hall. It was actually an old sheep farm. Any building that they built had to be in the style of what was already there, and it was beautiful, brand new, and really nice. We finished recording, and then we ended up mixing in Air Studios in London. This page was last modified on 1 August 2016, at 21:09. This page has been accessed 33,868 times.